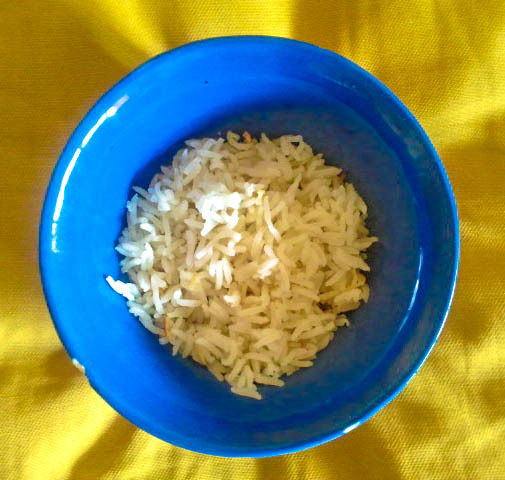 Khuska – Simple boiled rice. Bring 3 lt of water to boil in a big pot with an heavy bottom. When the water boils add rice and salt. Stir with a spoonful or a wooden spoon, cover and let cook for 12-15 minutes. When the rice is almost ready, drain it, then put again the rice in the pot and sprinkle with 125 ml of water. Stir to separate the grains and drain again. Wind up the cover with a cloth to absorb the humidity, let cook again at low fire to let the rice cook with its own steam for 30 min. The rice is well know all over the world to be a fundamental ingredient of the Indian cuisine. It can be served plain or as side dish. It can be also the main ingredient of several recipes: the most famous is biryani. 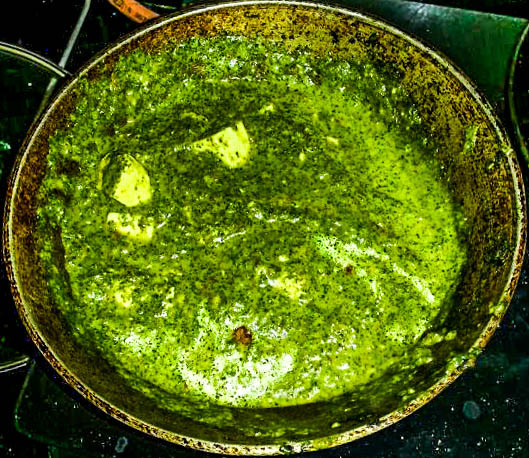 The paneer recipe is here. Cut the paneer into pieces of 5cm x 2,5 cm and keep it aside. Cook the spinach, chili peppers and ginger with salt and a sprinkle of water until the spinach are cooked. Let it cool down. Press it to let the water go away and then whisk them to obtain a puree. Keep it aside. Put the oil in a pan and heat it. Add the fenugreek and let it cook for 30 sec. Add the onion until they get coloured. Add garlic and cumin seeds and fry for 30 sec. Then add the tomatoes ad fry again for 5 min r until the water evaporates. Add the paneer and stir. Add the spinach puree and cook for 2 min. Warm the milk in a pot. When the milk boils add the lemon juice. As soon as the milk curdle, the whey starts to separate. Drain the curdled milk in a clean cotton lint to make it solid. Lift and tie the corner of the lint and let the liquid filter. Put the solid compost with the cotton lint under a load into a sink for 2-3 hours to obtain a block of cheese that can be cut into the desired shape. The recipes of this post are garam masala and tamarind paste. My first encounter with India was not the best. Around midday, forty-eight hours after I left the Italian grounds, I arrived in Pune. And the problems soon started. Travel is nothing but an inconvenience. There is always enough trouble where you are. To be honest, I’ve already met India the night before. It was late at night when I landed in Bangalore. The dazzling lights of the airport and the continuous comings and goings of people burdened by luggage made me think of being in a parallel universe, where day and night get confused. Appealed by the opportunity I had to finally have a look to this subcontinent and encouraged by the tobacco dependence, I set out for the sliding doors. The Indian airports are monitored beyond measure. None can enter without a flight ticket, or a visitor permit. Outside the doors there are barriers to divide the travellers from the rest of the world. Since that moment, I haven’t crossed the continent, except for a short visit in Morocco, and I had no idea about what I was getting into. I was out. A soldier, long in the tooth and a bit too slim, with a tommy gun in his hands, immediately blocked me. Now I think he sensed my hesitation. Do you know that if you go out, you can’t go back? I was doubtful. I have a plane tomorrow morning…I just wanted to smoke a cigarette. You can’t here. You have to go there. I looked around. There was nothing. The was nothing but me and him. At around 7 feet from us a bunch of possessed people flocked together around the barriers. I though if it was the case to leave the safety of silence and order to get into that din. Probably. I sacrificed my shelter e I steeped in the chaos. Rickshaw! Taxi! Where do you have to go? Give me your bags! Come with me! Come! Come! I was literally crushed by those words, I couldn’t possible understand. What did they want from me. I just want to smoke a cigarette. I gave up. Before I had time to light one up, I was already inside the airport. I was sure I was not going out any more. I still had several hours to spend inside the airport. And if I was not brave enough to face the Indian crowd, I could try to explore the Indian cuisine. I sat in a café and I looked inside the window. There was nothing tempting and nothing really particular. But the smell was quite strange. Vacuously exotic, unpredictably nauseating. The day after, walking through the street of Pune, I could still smell that aroma. The smell of food and incense, but also the smell of garbage and smog. The smell of temples and rituals. The smell of tradition. Of turmeric and cinnamon. Of chicken tikka masala and masala chai. Of lotus and fresh coconut milk. Of cherry pan and red chewed betel. Of burned garbage. Of urine. Of sickness. An astonishing mix, that when I left India, I hoped to have conserved under my skin. 45 gr black pepper in grains. Put all the ingredients in a clean coffee grinder or other spice grinder and grind as finely as possible. Store in a tightly lidded jar, away from heat and sunlight and use as needed. When I reached Pune it was almost noon. This time I felt safer going out from the airport. I knew there was a car the hotel sent that was waiting for me. I waited. But none stopped to pick me up. I came close to the swarm of rickshaw that were just waiting to worm some money out of me. I showed those men my hotel address. They all had an indifferent expression on their face. They all wore white or brown open shirts and slippers. Barefoot sometimes. Apparently dirty. 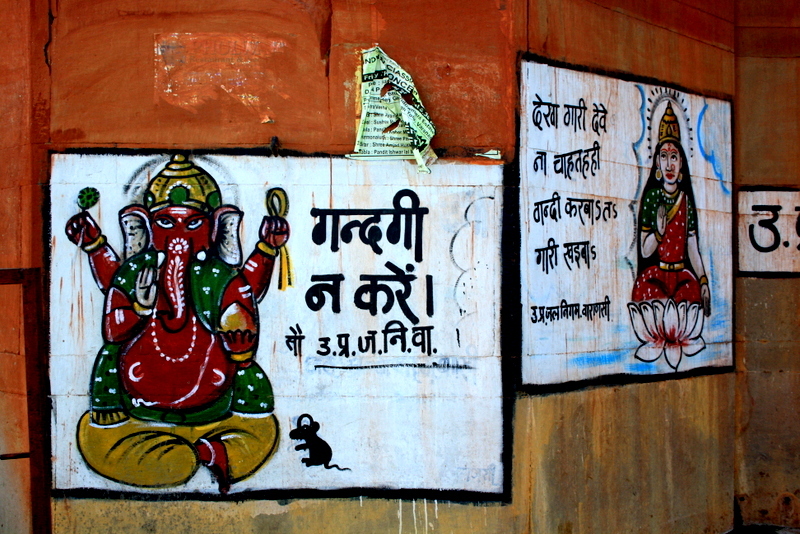 Any India’s travel guide will inform you to be wary of rickshaw drivers. And for all the time I spent there, just few of them where honest with me. To take a rickshaw is probably the most exhausting experience you could have in India. Their capacity in the rip-off and their constant deny of the obvious has to be admired. A continuous cascade of excuses. The meter that is not working. The false tables that to every km associates thirty rupees more. And the most odious one, when they don’t want to take you in some place, because of an indeterminable reason. But also between them there was a glimmer of light. Every morning I used to take the same rickshaw to go to university. A wise old man, with a warm and comforting smile everyday was waiting in his rickshaw reading the daily newspaper. He didn’t speak english. I didn’t speak hindi. We didn’t talk. We greeted each other with a smile. He had never asked me for a rupee more than he should. Infuse the tamarind with 4 tablespoons of water for 30 minutes. Filter to eliminate the impurity. Use tamarind to flavour meat and vegetable curries, chutneys and dhals. I looked into the prices. As soon that I heard that it was less than the one the hotel asked me, I got into the rickshaw and left the airport. Inside this Indian version of Ape, that someone called ‘a sort of yellow cubicle hitched up to a moped’ I could have a look of what I didn’t expect. Broken streets, people sleeping on pavements, women washing clothes in the river, men cleaning themselves in the river, minute and dirty children begging holding younger and dirtier children in their arms, stray dogs, garbage everywhere. I felt like a stranger in those places, but I also felt the need to know it better. After all, it could not just be that. Infuse the tamarind with 4 tablespoon of water for 30 minutes. Filter to eliminate the impurity. Use tamarind to flavour meat and vegetable curries, chutneys and dhals.